Take action in your town today to stop polystyrene plastic waste! Our oceans are choked with plastic, and the animals that live there are suffering for it. Download and print several copies of this letter, and then take them to businesses near you to encourage local businesses to stop using polystyrene. Birds, fish and sea turtles can also mistake plastic for food — with tragic results. You can take action today to stop plastic waste! Help make your community polystyrene-free. One of the worst kinds of plastic pollution is something we’ve known for decades we shouldn’t even be using in the first place: polystyrene, what most people call Styrofoam. A cup made from polystyrene foam might keep our coffee warm for a few minutes, but is that worth the risk to the lives and health of whales and sea turtles? We can live without it, but wildlife often can’t live with it. 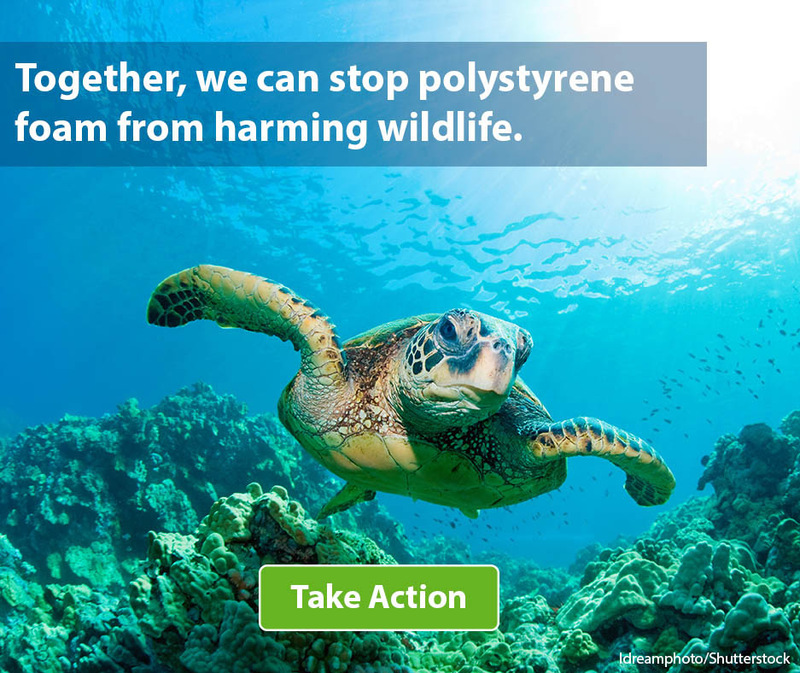 Even those of use who don’t live near the ocean can do our part to end the use of polystyrene: Environmental Action supporters across the country have called on governors, Congress, and McDonald’s to protect wildlife by phasing out polystyrene across the country. But you also can make change right in your own community, by asking the businesses you visit every day — your coffee shop, your local restaurant — to make the right choice for the environment. Download and Print the LetterSign up to take action in your community. 1. Mike Ives, “Whale’s Death in Thailand Points to Global Scourge: Plastic in Oceans,” The New York Times, June 4, 2018. 2. Trevor Nace, “Yet Another Dead Whale Is Grave Reminder Of Our Massive Plastic Problem,” Forbes, April 9, 2018.